Walk along Christchurch Road in Boscombe and look for the statue of Charlie Chaplin inviting you to enter a small but quirky bar and restaurant. Don’t just stop there, as tempting as it may be to stand and watch the old Chaplin movie playing on the TV above the bar or to grab a board game and while away a few hours playing Scrabble with friends, read a book from the pub library or just wander around looking at the art work that pops up everywhere. Grab a drink and walk through the pub to the garden. It was here that I met up with Vivien Hoffman, the inspiration behind a kaleidoscope of light and colour that is Chaplin’s garden. Much of the work has been done by Vivien herself; however there’s also work from local artists that she has commissioned. 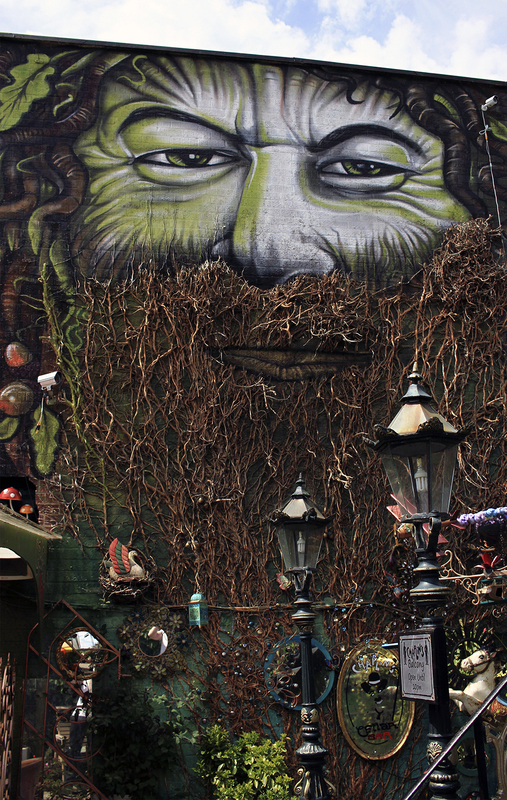 There are large murals adorning the walls ranging from Vivien’s Van Gogh inspired field of flowers through to the Green Man, whose beard has been formed from the dead ivy on the wall, and a fantasy woodland both of which were painted using spray cans by Krishna Malla. The latest mural is on the doors of the old stables, depicting an old-fashioned sweet shop in a scene from the Chaplin film, The Kid, which has been painted by a young local artist called Josie Ruessman. Inside, the stables are to be converted to another bar featuring flavoured vodkas sold from old sweet jars – the inspiration for this came from a bar Vivien visited in France that sold flavoured rums from sweet jars. 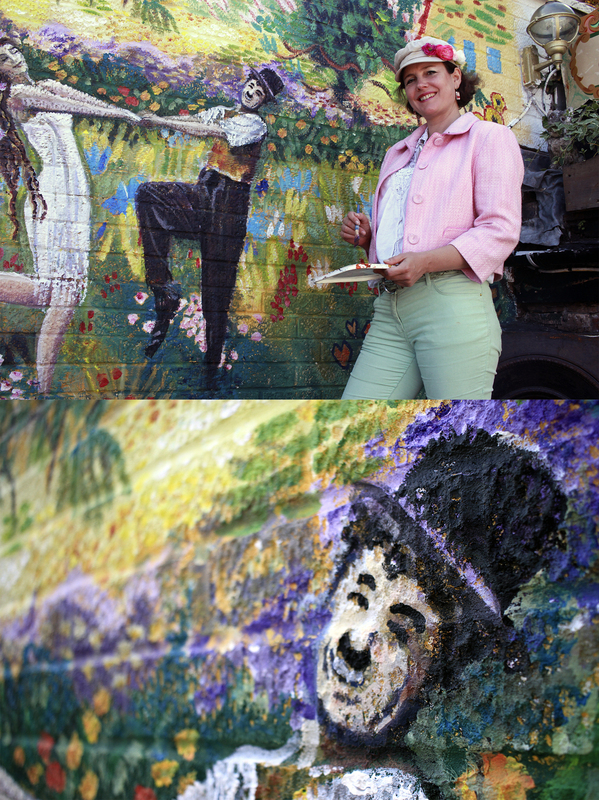 When Vivien started her work at Chaplin’s the owner at the time wanted things white or neutral colours, however the current owners Harry and Nick have allowed and encouraged her to express her love of colour and this shows everywhere including the old park bench painted in the colours of the rainbow. This is evident in the fact that the knight in armour standing in the corner guarding the garden is now in shining armour. Vivien has recently found a new passion for signwriting – something she used to find a chore. She is now producing art work using words inspired by a book of art deco fonts that she recently found. There is so much to discover both in the garden and the two bars, including good food a range of real ales and live entertainment seven nights a week. Chaplin’s really does have something for everyone. I will leave the last comments to local artist, customer and one of Vivien’s influences, Chris Green. “It’s lovely to see it all growing both the art work and the planting,” he said. 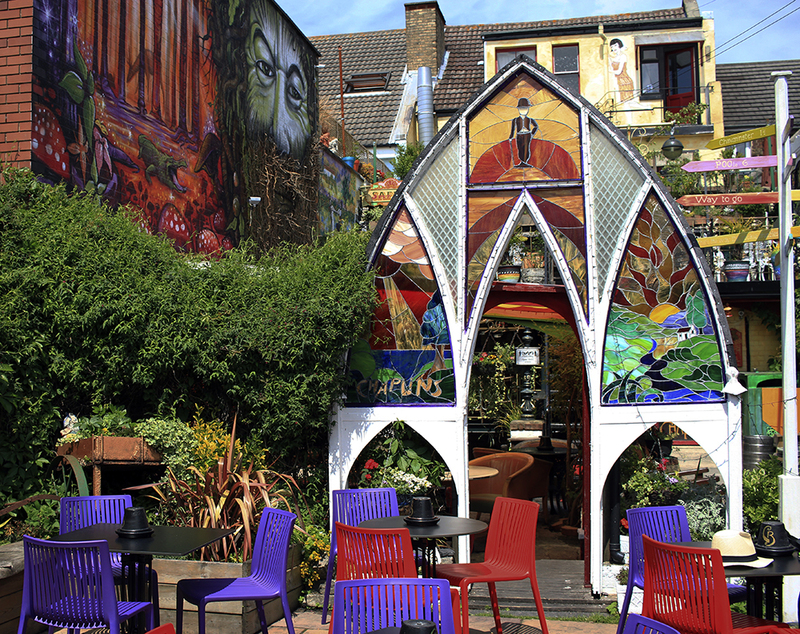 So if you find yourself in the Boscombe area look for the statue and discover a truly wonderful place, Chaplins.